Coco nibs, for garnish, optional. 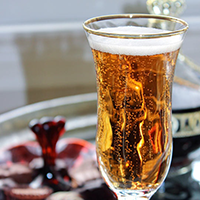 In a Champagne Flûte, pour the Chocolate Liqueur and the Raspberry Liqueur. Top with chilled Champagne. Sprinkle on a couple of nibs if you like.